Daryl Redsky, left, of Shoal Lake #40 First Nation, is part of a group that is raising awareness of water issues in indigenous communities. 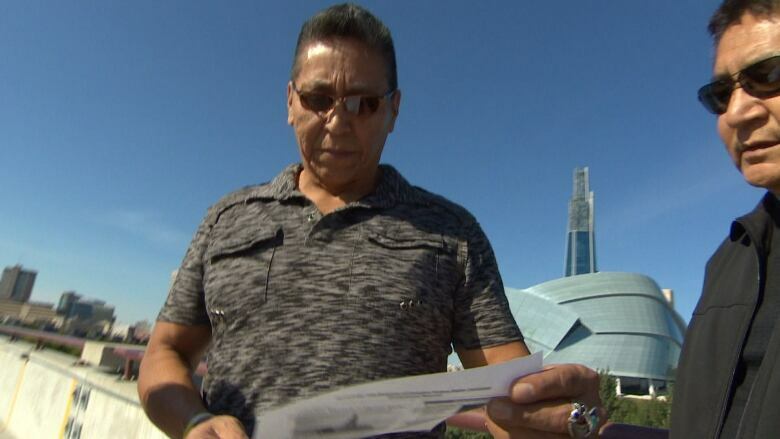 It plans to light a sacred fire near the Canadian Museum for Human Rights in time for its grand opening this weekend. (CBC)Members of the group plans to start the sacred fire on Thursday morning, and they plan to stay on site for four days. The group is gathering outside the museum, which officially opens this weekend, in part because one of the museum's key themes is water. "The central theme is healing with water, and we don't have a human right to water yet," said Alberteen Spence of the Tataskweyak Cree Nation in northern Manitoba. Spence said she wants to tell the public about water issues that indigenous people face, such as no running water in some communities and the lack of clean water in others. 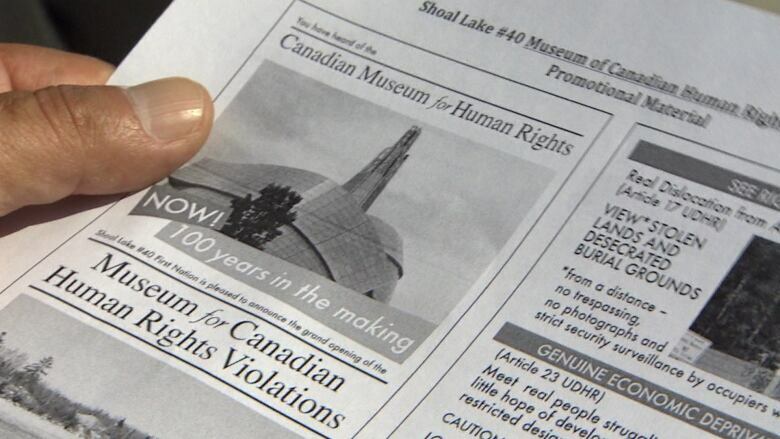 A flyer that the Shoal Lake #40 First Nation plans to hand out near the museum site this weekend. (CBC)"All I want is to have safe drinking water without fear that it's going to kill me because of pollution," she said. Spence said she also wants people to know about the effects Manitoba Hydro's projects have had on her home community. The Shoal Lake #40 First Nation has noted that the museum's use of water as a symbol of healing is "hugely ironic." The museum is using water from Winnipeg's municipal water supply, which is taken from Shoal Lake on the other side of the Ontario-Manitoba border. Daryl Redsky, a consultation officer with the First Nation, said what the city has done has forced the isolation of his people and presented no economic opportunities. "We want them to tell the truth about what's actually happened in the past, the injustices that's been placed upon our people just for the sake of water," he said. Spence and Redsky said the sacred fire event is not a protest, but they hope people will see for themselves the water issues that First Nations face. "Citizens and people can't be fooled that a building and an idea [are] going to speak for all human rights," Spence said.